The Dome of the Prophet (Arabic: قبة النبي‎) also known as the Dome of Gabriel (Qubbat Jibril) is a free-standing dome in the northern Temple Mount (Haram ash-Sharif) in Jerusalem that serves as a symbolic monument rather than a religious building. It is a part of the terrace of the Dome of the Rock and is one of three Ottoman-built free-standing domes in the Temple Mount vicinity. Originally, the Dome of the Prophet was built in 1538 by Muhammad Bey, Ottoman Governor of Jerusalem. However, it was restored in 1620 on the orders of Farruk Bey, the succeeding Governor of Jerusalem and completed during the reign of the Ottoman Sultan Suleiman II. The dome today mostly reflects the 1620 restoration. The dome is a commemoration of the Islamic prophet Muhammad. Further additions were made to the dome in 1845. Several Muslim writers, most notably al-Suyuti, claimed that the site of the dome is where Muhammad led the prophets and angels in prayer on the night of Isra and Mir'aj before ascending to Heaven. Endowment documents from the Ottoman period indicate that a portion of the endowment of the al-Aqsa Mosque was dedicated to maintain the lighting of an oil-lamp in the Dome of the Prophet each night. The Dome of the Prophet's octagonal structure is built atop eight gray marble columns. The dome is hemispherical and is supported by pointed arches decorated with red, black and white stones. The ancient mihrab is made of a white marble slab embedded in the floor and surrounded by red-colored stones and subsequently delimited by a low wall, that traditionally opened in the north to allow entrance of Muslim worshipers heading southward to Mecca for the Hajj. 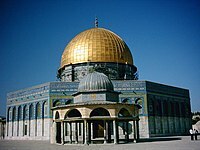 The dome is much smaller than the other free-standing domes in the vicinity, being no larger than the entrance to the Dome of the Rock structure. ^ a b c Prophet's Dome Archived May 7, 2008, at the Wayback Machine Archnet Digital Library. ^ Dome of the Prophet Noble Sanctuary Online Guide. ^ a b Visit the Dome of the Rock Kentucky Educational Television. ^ a b c Al Masjidul Aqsa Site Plan Archived October 6, 2008, at the Wayback Machine Al-Aqsa Friends 2007. ^ Jacobs, Daniel. Israel and the Palestinian Territories Rough Guides, p.350. ISBN 1-85828-248-9. Wikimedia Commons has media related to Dome of the Prophet. 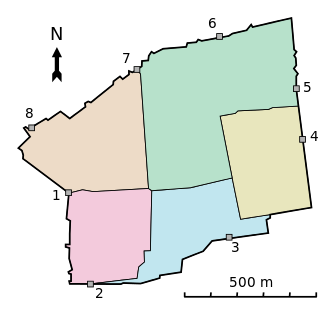 This page was last edited on 2 October 2018, at 08:03 (UTC).